Pre-implantation Genetic Diagnosis, or P.G.D. has been helping couples on their fertility journey for some time, but new uses are being found, for the technology, that will allow more people to enjoy parenthood. P.G.D is used as a way to screen embryos, during the in vitro fertilisation process, before they are implanted in the womb. It is used to help couples, in cases where either partner is a carrier for a serious genetic disease. It is a way to reduce the risk of a serious hereditary disease being passed through the generations of a family. When in vitro fertilization is conducted, fertilized embryos grow in a petri dish for 5 days before being placed in the uterus of the mother. 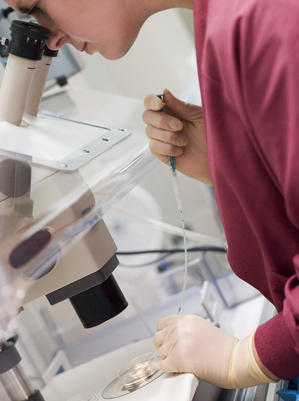 When P.G.D testing is being done, embryos grow in the petri dish for 3 days, at which point a technician will remove a single cell and analyse it for genetic abnormalities. If abnormalities are found, that embryo is not implanted on the fifth day of growth. This helps to ensure that only healthy, viable embryos are transferred. The chances of a pregnancy ending in miscarriage increase with age. This is often caused by chromosomal abnormalities, which occur more commonly as we get older. P.G.D can detect these abnormalities helping to weed unviable embryos out of the in vitro process. This greatly reduces the likelyhood of miscarriage, allowing more couples a much better chance of having the families they dream of. This type of diagnostic work is not without opposition. Many people feel that science shouldn’t intervene in the natural course of fertility. Others worry that this type of genetic diagnosis may someday be used to tailor make children to suite various aesthetic or intellectual criteria.